There are inevitably times when you will need to cross organizational boundaries in order to get trading partners, customers or suppliers integrated into your business processes. Traditionally, in a BizTalk environment, this would mean that you would have Web services hosted in IIS or in the BizTalk process on the BizTalk Servers. You then would reverse-proxy those services to make them available outside the firewall. You will also likely have a load balancer in play for either volume or high-availability purposes. You would further need to define a security strategy. Crossing a security boundary like this is never easy and commonly introduced moving parts and some degree of risk. By extending the ESB on-ramp to the Windows Azure platform, we can address several of these concerns. Windows Azure provides the Windows Azure platform Service Bus and the Windows Azure platform Access Control Service. These are both services we can use to extend the BizTalk on-ramp to Windows Azure. The previously described WCF-Custom adapter allows you to select any bindings that are available on a given machine. When you install the Windows Azure platform AppFabric SDK, you get several new WCF relay bindings that allow you to communicate with the Service Bus. Instead of directly opening our infrastructure to the outside world, we will instead use that relay feature. External partners can publish their messages to the Service Bus, and we will receive them because we are the subscriber. From an implementation perspective, it is trivial to receive messages from the Service Bus. You just create a new BizTalk receive location, choose one of the relay bindings, set the security credentials, and enable the receive location. Once you are done that, you have created an endpoint in the Service Bus (with an identifying namespace), and the Windows Azure Service Bus will send messages matching that endpoint to you. Figure 1 shows what this receive location looks like. Figure 1. 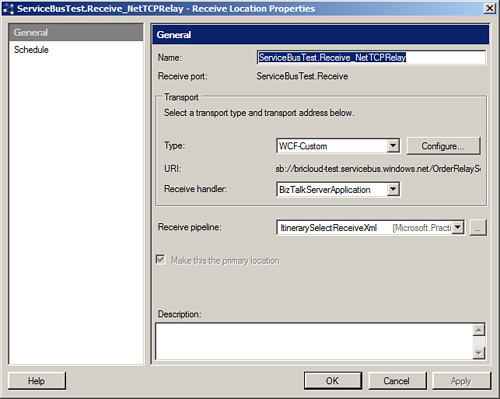 Notice the WCF-Custom adapter, as well as the URI, which indicates the Service Bus endpoint address. 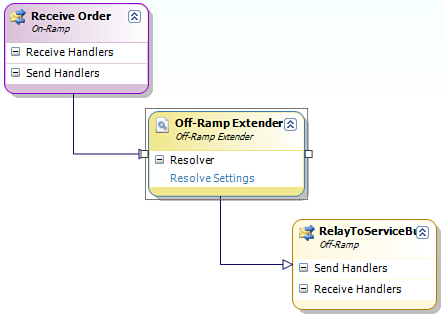 The receive pipeline being used here (ItineraryReceiveXml), is one of the standard pipelines included with the ESB Toolkit. This means we could potentially implement something like passing a received message into the business rules engine; having a business rules engine evaluation determines which itinerary to use, retrieves that itinerary from the repository and stamps it on the message. This is identical to the sort of sequence we may go through if we were picking up a message from a SharePoint document list or from a flat file. The only difference is we made a couple of minor configuration changes to the WCF-Custom adapter settings and now we have extended our on-ramp to the cloud. We have a secured pipe up to the Service Bus because we are the ones that initiated and secured the connection (using standard WCF message and transport security options). In addition, anyone publishing messages intended for the service endpoint will need to be authorized by the Windows Azure platform Access Control Service before they can do so. This secures the link from the external organization to the cloud. In addition to extending the ESB on-ramp to the cloud, we can take advantage of the Windows Azure platform Service Bus by sending messages to it from our on-premise ESB. Using the WCF-Custom adapter provider and the Windows Azure platform, AppFabric SDK gives us the necessary relay bindings and we simply need to set the appropriate adapter provider properties. From a BizTalk perspective, we can use the WCF-Custom adapter with either a static or dynamic send port. From an ESB perspective, though, the preferred approach would be to use an itinerary that uses a dynamic off-ramp (send port) to send the message. This itinerary would specify the processing steps to receive a message, resolve the destination and adapter properties, and then relay the message on (Figure 2). Figure 2. A visual representation of a three-step itinerary. The properties of the Resolve Settings resolver are shown in Figure 3. To keep things simple, this example uses a static resolver (which means that the statically defined settings will be dynamically applied when the itinerary is executed). Figure 3. Sample Resolve Settings property values. In order for this to function properly, it is crucial that the Action, Endpoint Configuration and Transport Location properties be set correctly. 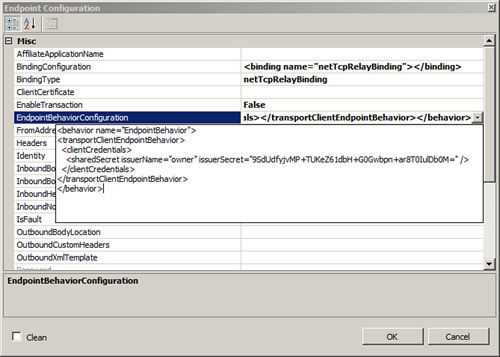 The Endpoint Configuration properties are now set as shown in Figure 4. Figure 4. The Endpoint Configuration settings. This example uses the netTcpRelayBinding (one of the bindings you get from installing the Azure AppFabric SDK). There are additional options available to accommodate other messaging patterns, such as multi-case and request-and-response.